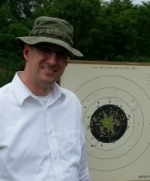 I've attended a Zinz clinic and would like to get a roll trigger for my range officer. Who builds them. I have 3 of KC's drop in kits (22, Wad, Hardball) guns and one he did himself in the CF (9mm) he built for me. The drop in kits are fantastic but the one he did for my 9mm is better yet. First you need to define roll! I like the roll I put on my trigger but it talking to others I can find 10 different explanations of how roll feels. I have felt Zinn's trigger at Camp Perry, He has a nice smooth what I call an up hill roll and the type I like. I have felt many smiths roll triggers but would not like it on my gun. The Best roll trigger I got from a smith was from Jimmy Clark, I explained what I wanted and he said I know what you want, pick it up tomorrow morning. (At Camp Perry) Picked it up and it was perfect! Too often at Perry I had someone else do a trigger job at Perry that claimed they could do what I wanted, made the mistake and gave them the gun only to find it was terrible and I was stuck in my hut trying to get it back to where it was before being worked on. From those few times on if I were to get a trigger job done at Perry I remover the hammer, disconnector, trigger spring and sear. Purchased new and had the trigger worked on! Only Jimmy was able to do it right! Unfortunately he passed away. His trigger lasted me 2 years and I was back to trying to get a good roll. I finally gave up and started doing my own triggers! I pasted this here from my reply from the other same topic. I agree with getting the drop-in, get some shooting under your belt then with a better understanding of what you want get a good smith to touch-up the drop-in. Froneck wrote: I pasted this here from my reply from the other same topic. I agree with getting the drop-in, get some shooting under your belt then with a better understanding of what you want get a good smith to touch-up the drop-in. I also like the KC Crawford triggers that I have tried. KC is a good gunsmith to do touch up work if you find that the trigger isn't just how you would like it. Thanks guys. Have sent him my info.